I hope this card shows up OK for you on your computers. This on in particular is hard to tell if my editing is OK because it changes drastically on the tilt of my laptop screen. And since I am literally working with it on my lap, it keeps changing! I was making this card and since it wasn’t for anyone in particular, I naturally thought of using my own monogram but then thought again and made it for my mom. She is really supportive of our family; she is always buying the kids TONS of clothes, we pretty much don’t need to buy the kids anything except shoes and she buys those often too. Can you believe I have paper and ribbon that match so well? They really do IRL. The background is embossed with the Victorian folder, I made it a wee bit smaller than a standard card because the folder isn’t quite that big. I find that quite annoying! Just another 1/4” each way and it would cover a full card front. They are making larger folders how so that is great. TIP: In case you are wondering, yes, it did take a lot of twisting to manage to get all of the loops and tails with the print facing up! The trick is to get the twists inside the knot, twisting while pulling tight. If you try to twist them after the knot is tight, you will need adhesive to keep the ribbon from twisting back and it won’t look as good . Previous postWAHOOO! DT for Clear Dollar Stamps! Limitation of cuttlebug is the small size of folder right?Anyway, that monogram is stamped? Or printed? I love green + brown combination. Your explanation on how to make the perfect bow made me smile. I have tried and tried to explain it to others but I think sometimes it's just a think that takes the right “touch”. You obviously have it. 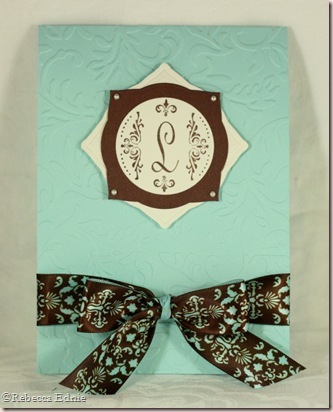 I love this card, it's fresh coloring paired with the deep chocolate is both classic and contemporary.I really love it.Jenn (Jaemac from Swapbot)(thanks for the markers link, I'll email you tomorrow with a plethora of questions, lol. )Happy Easter! swapbot:samashThis is even better then a magazing card :P. I always make the bows separate and then stick them on which is so much easir. It is a bit difficult to see the dry embossing, but it's there. It's a lovely card. I like how the Nesties work together.